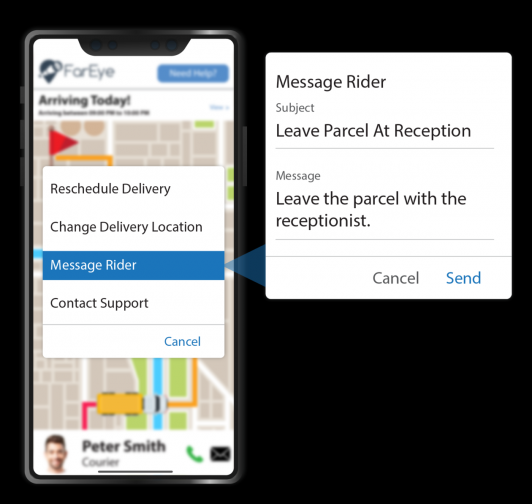 DIC, UAE - July 5, 2018 - PRLog -- FarEye, a leading global digital logistics platform today announced the launch of its Delivery Experience Suite – 'Delight' that helps businesses increase their Delivery Happiness Score – the ultimate measure of customer success. It enables businesses to provide a seamless and personalized experience to the customers. FarEye is a leader in B2C logistics technology and is widely used by global giants like Walmart, DHL, Noon and Amway. In the face of volatile, accelerated change and rising customer demands, supply chain and logistics companies are under extreme pressure to maintain or improve current levels of performance. 66% of shoppers buy goods from one retailer in preference to another because of more appealing delivery services offered. It is more evident than ever that with evolving customer expectations a superior delivery experience that offers live tracking, personalization, and customization of deliveries becomes imperative. The suite helps companies in transforming customer engagement and experience. Commenting on the launch, Mr. Kushal Nahata, CEO & Co-founder, FarEye, says, "Delivery happiness score is a metric to measure the overall effectiveness of your deliveries. While more and more companies understand that providing a great customer experience is necessary for business growth, many have a long way to go, bringing all the parts together to make it a reality. The bottom line is that companies struggle to get a cohesive, holistic, outside-in view of their customers' experience and that is where FarEye Delight bridges the gap."